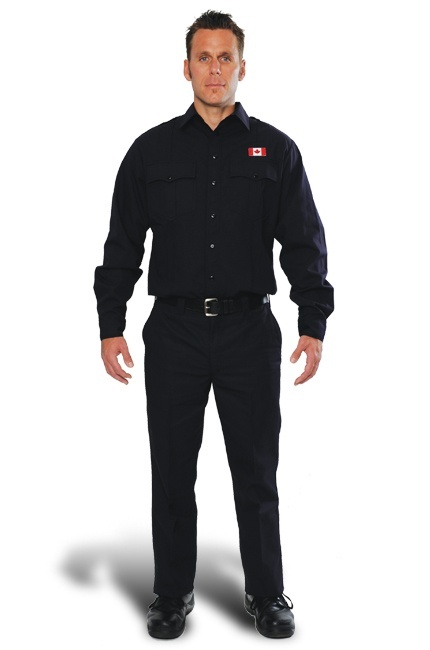 Combination shirt and pants offer comfortable clothing for the station made from Nomex, TecaSafe, and Poly Cotton. Certified Protection: NFPA 1975 Certified in Nomex and TecaSafe. Made to Measure: It is made to measure and order, not stock product. Quality Construction: Made in Canada with triple row stitching and reinforcements. Upgraded Style: Includes snap closure with decorative buttons, contoured spade breast pockets and sewn-in creases as standard features. Epaulettes and sewn-in creases for crisp, professional look. Reinforced badge holder positioned on the front seam for added strength. Two-layer reinforced upper back (yoke). Snap closures with decorative buttons. Two slash pockets and two seat pockets with button closures. Triple row of full fell sewing on each outseam. Heavy-duty brass zipper (with Nomex® tape) used for all garments made from FR material. Steel hook and bar waist closure. Shirt Options: Available in long and short sleeve styles. Fabric Choice: Available in a number of fabrics including Nomex, Firewear and Poly Cotton; is made to measure and order.